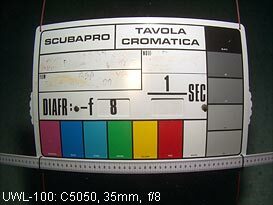 Depth rating 60 m (lens has sealed internal air-spaces). 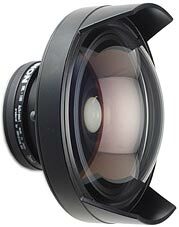 Achromatic afocal wide-angle converter with anti-reflection coatings front and back. Max. 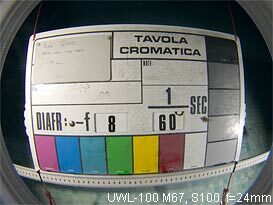 coverage: 100° UW, 158° in air (when camera lens 35mm equiv: focal length is 31.5 mm). Actual coverage depends on camera and housing - see tables below. 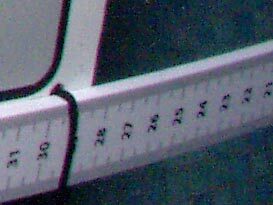 Vignetting is likely occur when camera 35 mm equivalent focal length is less than 31.5 mm. Zoom in to eliminate this effect. Construction: 5 elements, 4 groups, optical glass. 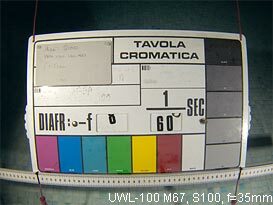 Dimensions: 100 mm dia., 58.5 mm long. Weight: 625 g in air, 370 g UW. Fits onto UWL-100 and forms sealed air cavity in front of lens. Increases max. 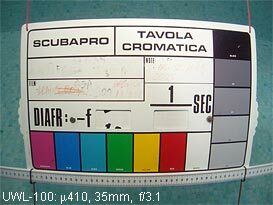 coverage to 131° underwater (when camera lens 35 mm equiv. 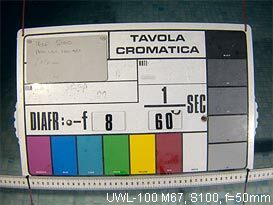 focal length is 31.5 mm). Actual coverage depends on camera and housing - see tables below. 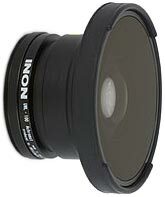 Dimensions /mm: major diameter: 129.6. length: 48.9 dome unit only, 85.5 with UWL-100. Weight: 498 g dome unit only (air). 587 g with UWL-100 underwater. Angle of coverage refers to format diagonal with main camera lens focused at infinity. 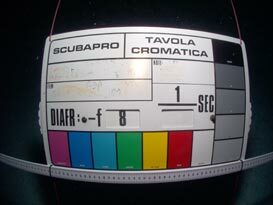 Coverage underwater with dome lens is less than coverage in air because water filling the space between the housing port and the UWL-100 rear element increases the effective focal length of the camera lens. 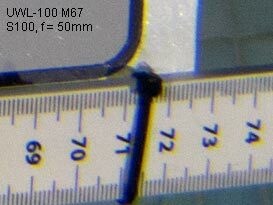 calculations based on m=0.57077 when UWL-100 rear element is immersed in water. where f35 = 35 mm equiv. 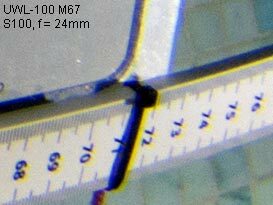 focal length in mm, and m (magnification) = 0.57077. Note: picture cutoff region is normally dark but has been masked in grey to make it visible. 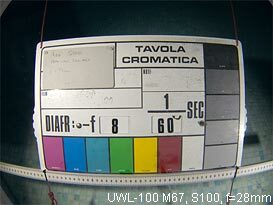 Pictures taken using Canon S100 in ikelite housing. Aperture = f/8. 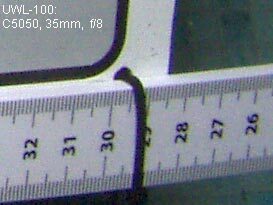 Focal lengths given are 35 mm equivalent. The dome port was not fitted. 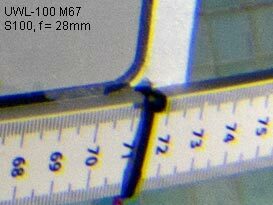 Note that chromatic aberration is worse with the S100 than it is with the C-5050 and μ410 cameras. 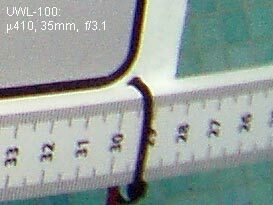 This is because the S100 5× zoom lens forces the housing manufacturer to place the port about 25 mm away from the lens entrance pupil at the wide setting. Best results will be obtained when using a fixed focal length main lens, or limited-range zoom, with the port close to the front of the lens. 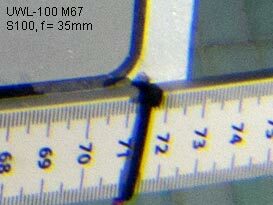 Radial corraction data for the UWL-100 (with and without dome adapter) are given in the M67 adapter comparison article. Pictures by David Knight & Steve Knight. © David W Knight 2004, 2012, 2018.